« Lester Butler — 13 with a bullet! It’s rare for any “new” Lester Butler or Red Devils material to be released now, more than 10 years since Butler’s passing. 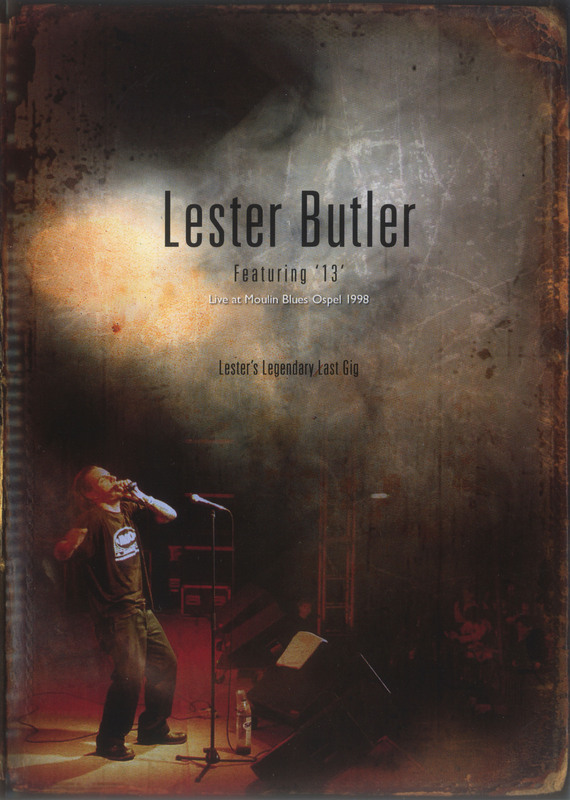 Which is why the 2008 DVD “Live at Moulin Blues Ospel 1998 — Lester’s Legendary Last Gig” is such a special document. Recorded at Butler’s last gig, just a week before his untimely death, the DVD captures the harpist and his band (Alex Schultz on guitar, Eddie Clark on drums and Mike Hightower on bass) at the height of their powers, performing a stellar set at the annual blues festival in the Netherlands. That Lester looks so happy throughout the disc is a real bonus. and a remarkable three-song bonus set from the Red Devils at Moulin circa 1993. I’m a guy that has played with a lot of harmonica players, some of the greats of our time. Lester wasn’t the technician that some of these guys were, but I began to hear and feel something from him that was deeper, that had more raw emotion in it. It was really something to do with the blues. Meantime, he was listening mostly to Snoop Dog [sic], Iggy Pop, and who knows what else. This entry was posted on February 19, 2009 at 9:30 pm and is filed under lester butler with tags 13, alex schultz, blues, dvd, eddie clark, lester butler, lester's legendary last gig, mike hightower, moulin blues, music, ospel, red devils. You can follow any responses to this entry through the RSS 2.0 feed. You can leave a response, or trackback from your own site. Just wanted to add that after his last concert at the Moulin Blues Festival Lester was invited on the stage on Sunday May 3rd at a Paladins concert in de Effenaar in Eindhoven, NL (which is very close to Ospel where the Moulin Blues Festival was held). There he joined Dave Gonzales and friends to play along with a few songs. I don’t remember any titles but I do assume they also played one or two Red Devils or 13 Songs. I assume this was really his last performance before he flew back to LA and his untimely death. Jeroen, this is great information, thank you for sharing! Did you attend that May 3 gig, or know someone who did? I’d like to get it verified through a flier, or photo or newspaper clipping. I’ve always assumed he probably played some harp or sang — even on stage — at some point between May 2 and May 9, and that he probably hung around some after the Moulin performance before returning to the States. That week seems to be a bit of a gray area in the timeline, so any help we can get filling in the blanks would be great. Take care! I would like to buy; DVD Live at Moulin 1998 — Lester’s Legendary Last Gig – Is that possible ?? Please contact me, on my e-mail. I am sure there are darker corners of the Internet where you might be able to get one. Excellent dvd. Sadly long out-of-print by know. Second hand copies pop up from time to time or you can head over to youtube where you can find the full show.